Ho Chi Minh City, Nov 8: Five-time World Champion M.C. Mary Kom and former Asian Championship silver medallist Sonia Lather kept Indias flag flying high in the Asian Boxing Championships, cruising into the finals of their respective weight categories here on Tuesday. 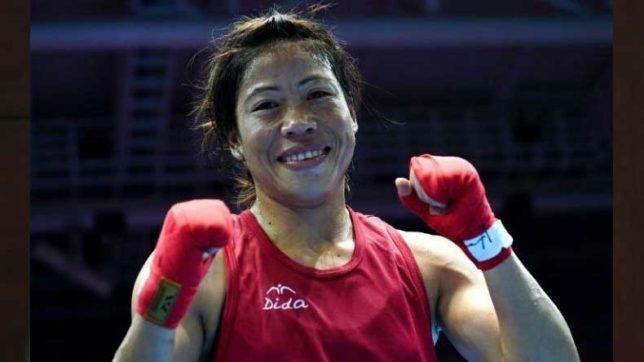 Mary Kom, who is making her comeback after more than a year, thumped Japan's Tsubasa Komura 5-0 to stay on course for her fifth gold medal in the continental event. The Manipuri pugilist will take on Kim Hyang Mi of North Korea in the title clash of the 48 kilogram category. Sonia too was imperious against Yodgoroy Mirzaeva of Uzbekistan, beating her in the 57kg category. She will now face Junhua Jin of China for the gold. Mary Kom used her all tactical nous in the semi-final against Komura, who came up with a defensive approach. Komura maintained a safe distance through the opening round, perhaps hoping to put pressure in the next rounds. But Mary still found a way to land her punches and seized the initiative. She upped the ante in the second round and landed a barrage of punches to pick up crucial points. With the balance now clearly tilted in her favour, she adopted the cross-armed guard and avoided anything that was thrown at her to be announced as the well-deserved winner. "I am happy to be in the finals in my first comeback tournament itself. It was a tough fight and now I have to get ready for the finals. I have been fighting for my country all these years and that's what makes it so fulfilling for me," Mary said. "I have been fighting for my country for many years and each time when I start well, that is a good sign. It motivates the others to perform well too." Sonia too felt confident about the final. "It has been a good tournament so far, and I will do my best in the finals," she said. Both, Mary and Sonia, felt India was doing well in international tournaments in recent times due to the professionalism and vision shown by the new dispensation. Veteran Sarita Devi, who seemed good for her fifth gold medal in the Asian championship, went down to China's Dan Dou in the 64kg category. Shiksha lost to Lin Yu-Ting of Taiwan in the 54kg category while Seema Poonia who stepped into the ring for the first time in the tournament couldn't get a measure of Guzai Ismatova of Uzbekistan in the +81kg competition. Lovelina Borgohain (69kg) put up a spirited fight before going down to Valentina Khalzova of Kazakasthan while Priyanka Choudhary lost to Yeonji Oh of Korea in the 60kg category. All five will bring home a bronze medal each though. For Bhaiya, Priyanka will contest against Modi in Varanasi ?